Buffalo Pattern see the Northern Ceramic Society Journal pages 97-136, Vol. 29, 2013 for an article 'Animals on Printed Pots: Understanding the Roles Animals Played in Early British Wares c.1790-1820' by Loren L. Zeller. The epitaph is framed with a decorative, hand painted border consisting of flowers, leaves and tendrils. A view of the large jug revealing the various floral sprays that were added to the piece to fill in and enhance the early Chinoiserie design. A rare, large pearlware commemorative jug printed in blue with the Buffalo, or Boy on a Buffalo, pattern. Printed on the outer rim is a large and elaborate butterfly border pattern with a modified version of the latter on the inner rim. Floral sprays in four distinct patterns are printed around the jug in areas that are not covered by the central pattern. The pattern on the handle is a modified version of the more traditional Buffalo border pattern. 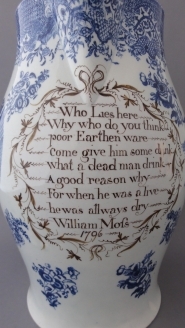 The jug was made to order to commemorate the death of one "William Mofs" and is dated "1796". A highly decorative epitaph was skillfully hand painted, underglaze, in brown (see below). The epitaph, given its humorous tone, was possibly composed by surviving friends of the deceased Mr. Moss. For more on this rare jug and the Buffalo Pattern see the Northern Ceramic Society Journal pages 97-136, Vol. 29, 2013 for an article 'Animals on Printed Pots: Understanding the Roles Animals Played in Early British Wares c.1790-1820' by Loren L. Zeller.